ALTRON-AW1699F-PEL Single pole top full swan neck bracket. Standard mounting variations to suit most Installations. 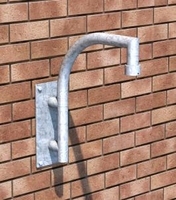 ALTRON-AW1699H-PEL Single pole top Half swan neck bracket. Standard mounting variations suit most installations. ALTRON-AW1699TF-PEL Twin pole Full Swan Neck, Standard mounting variations suit most installations. ALTRON-AW1699TH-PEL Twin pole top Half swan neck bracket, Standard mounting variations suit most installations.